Lynden Transport trucks have been rolling in and out of a construction site this summer hauling panels, joists and steel for a new fish hatchery near Anchorage. The $96 million Jack Hernandez Sport Fish Hatchery will open in June 2011 on the north bank of Ship Creek and will rear rainbow trout, Chinook and Coho salmon, Arctic Char and Arctic Grayling for the state’s anglers. Lynden has been transporting construction materials for contractor Kiewit Building Group to build a 141,511-square-foot building that will house 105 circular fish tanks. 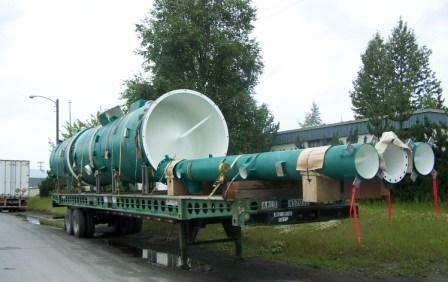 Lynden drivers have transported steel and aquaculture tanks and equipment from British Columbia, deck and joist from Washington and insulated panels from California. According to Kiewit General Superintendent W. Scott Davis, Lynden has always been professional and reliable. “When moving and tracking freight, especially materials critical to the project’s schedule, it’s nice to be able to trust that deliveries will be made as scheduled,” he says. It’s estimated that nearly three of four rainbows pulled from Alaska streams and lakes grew up in one of Alaska's fish hatcheries. Hatcheries are responsible for 70 percent of the rainbows and 20 percent of the king salmon caught in the state. Fourteen employees staffing the facility will incubate and rear the fish in tanks ranging from 2 feet to up to 26 feet in diameter. 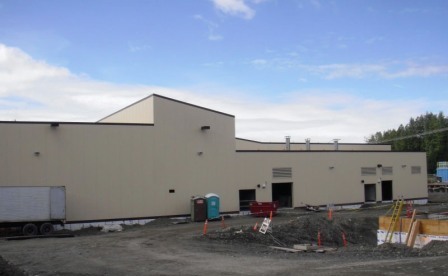 According to the Alaska Department of Fish and Game, the first fish developed at the new hatchery will be grayling and rainbow trout fingerling next summer, with the first rainbow trout hitting local lakes in the spring of 2012. The new hatchery will serve the state's need for 30 to 50 years. Instead of transferring fish from the old facility to the new one, biologists will begin with eggs at the William Jack Hernandez Hatchery to minimize the risk of disease. “Many Lynden employees love to fish Alaska’s waters, so this project was a great fit for us,” Paul says.